The GlenDronach Distillery has released The Grandeur Batch 9, an exceptionally rare batch of single malt whisky. The 24-year-old expression is composed of Spanish oak sherry butts distilled in 1990, 1992 and 1993, each carefully selected by The GlenDronach master blender for their distinct flavour and aroma. Matured entirely in sherry casks, the subsequent blend is a fine reflection of Spanish oak sherry cask maturation. This process results in an expression that is unique in complexity and balance, with notes of stone fruit, baked quince and glazed cherries on top of sandalwood, roasted chestnuts and a hint of musk-scented leather. Fresh oak balsam comes through on the palate before the finish of dark chocolate mint, raison and angelica root. Bottled at 48.7% ABV, The GlenDronach Grandeur Batch 9 is non-chill filtered and of natural colour. Each of the 1,487 bottles produced is individually numbered and sealed by hand, making this release a real collector’s item. 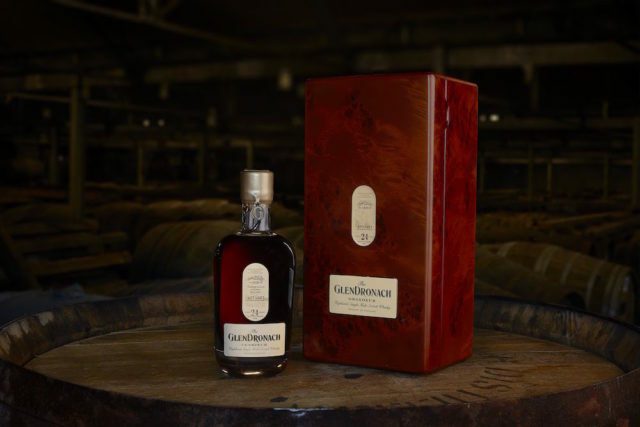 “Grandeur Batch 9 is a single malt of finesse, powerful complexity and persistence, reaching heights of maturity and depth of character that approach single malt perfection,” said The GlenDronach master blender, Rachel Barrie. The GlenDronach Grandeur Batch 9 is available at special retailers worldwide from February 2018. Next article#BOURGOGNEWEEK Hong Kong Is Back For 2018!